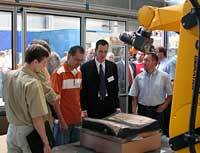 With more than 20 years' experience (established in 1992), carat robotic innovation GmbH is now a competent system house and your reliable partner robot applications. Alongside the hardware solutions, carat develops and sells the universal offline programming software FAMOS robotic® for simulation, programming and process optimisation of robot applications. Everything we do is based on the proportion of their economic success our customer expects from the use of our products. Our customers' and partners' satisfaction is the driving force behind our thoughts and actions. Our aim is to establish long-term, confident cooperation and partnerships. carat values quality. The main effort lies in the creation and delivery of high quality systems and products. The high level of education of our employees is an important component here. Since 2006, our quality requirements have been confirmed by the regular audits according to DIN EN ISO 9001:2008.